When it comes to energy balance, we have some pretty nifty mechanisms to try and help us regulate it without us realising. Given how much variation we have in what we eat and how much we move about day to day, it’s pretty impressive that on average per year we manage to only push into a positive energy balance by 10 calories (two smarties) a day. Hormones play a huge role in this energy balance equation. The two major players here are leptin and ghrelin. When these hormones are produced they travel to an area of the brain called the hypothalamus. The hypothalamus is a bit like the organisation centre of the brain; your body creates signals in response to things going on in your body and around you and these signals are sent to the hypothalamus. The hypothalamus integrates and sorts through these thousands of signals and generates actions that make sense in response to keep us alive, like eating when we are hungry. Ghrelin is a hormone that’s released from the stomach and small intestine and travels in your blood to the hypothalamus. It is often called the ‘hunger hormone’ because its levels rise in the absence of food triggering us to find food and eat; levels then fall again after you eat. When you aren’t eating enough to maintain energy balance, whether intentionally or not, ghrelin levels will be higher, likely creating cravings and testing your will power to override the bombardment of ghrelin signals to your brain and not eat the whole cake that’s been left out for Karen’s birthday. Back in the day before supermarkets existed, this hormone was actually vital to survival because it not only creates hunger signals but actually allows us to have the capacity to go and hunt and gather our food even when we have no real energy from food. It does this by creating a stress response in the body (releasing our stress hormones cortisol and adrenaline) to make you feel alert and it causes blood sugar levels to increase to provide energy to your brain and muscles to take action! It even has an effect on the other side of the energy balance equation. In times of low energy intake, it reduces your metabolic rate to conserve energy (reducing energy output). 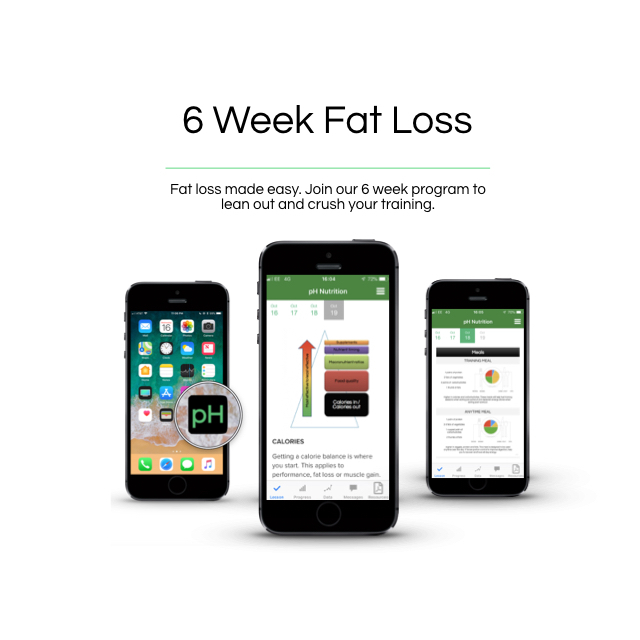 Regardless of current body fat percentage, ghrelin is released when energy intake is low and energy balance becomes negative, it is our body’s protective mechanism in response to starvation. Leptin is the other key player in this hormonal control of energy balance. Leptin is produced by our fat cells and travels to the hypothalamus to inform the brain how much body fat we have stored and if it’s going up or down. This is because evolutionarily the brain needs to know if we have enough energy stores to grow and then feed a baby (it’s not quite caught up to formula yet). When leptin levels drop too low this tells the body to switch off the baby maker, so we don’t waste energy on keeping systems going that won’t help us individually or as a group to survive when food is scarce. Interestingly, when leptin levels are too high it bypasses the brain and acts directly on your ovaries and affects the menstrual cycle and reproduction. 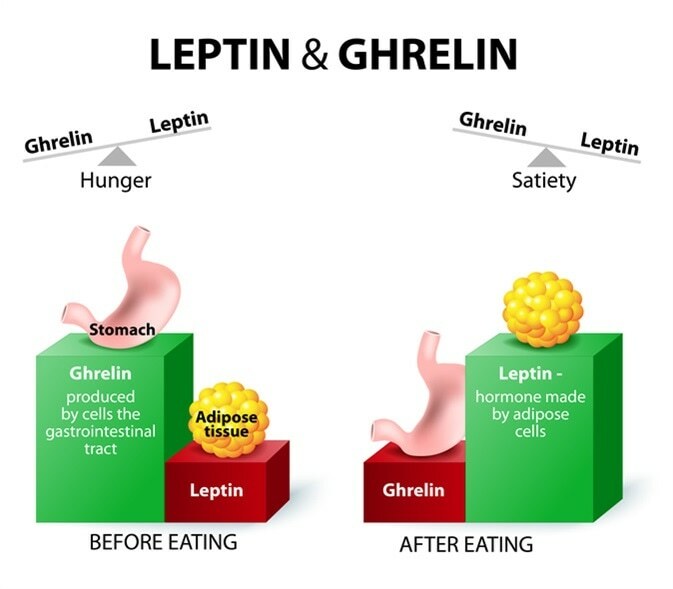 To maintain energy balance and a healthy body fat percentage leptin and ghrelin both work on the hypothalamus but they work by fighting each other for their spot. When we are in a positive energy balance, leptin levels rise and fight off more of the ghrelin. The higher the body fat percentage the higher the leptin and the less ghrelin gets a look in. This means our metabolism stays firing to increase our energy output and our hunger spikes are dampened to reduce our energy intake. But when we are in a negative energy balance and lose body fat leptin levels fall and ghrelin can take hold on the hypothalamus, reducing our metabolism to reduce energy output and making us hungry to go and hunt for food! So if this system is so great why do we struggle to stay in energy balance and maintain an optimal healthy body fat percentage? There are a whole host of other factors that influence our energy balance equation. First and foremost, we don’t just eat because we are hungry! As humans we eat for so many different reasons from emotional to social and even environmental. Overeating is easy in our new environment full of ‘extreme reward foods’ which are high fat and high sugar that light up the reward centre of our brain like a Christmas tree, I’m thinking Krispy Kreme here! But under eating is also common with our hectic work and on the go lifestyles, time can just pass by and before you know it you havn’t eaten for 7 hours! But it’s especially common for women who train to be under-fuelling and be in a negative energy balance for a few key reasons. Firstly, there is a lot of pressure on women to look a certain way. This is general in the media, but each sport will also come with its own female idols who may or may not be healthy. For CrossFit athletes this may be to look very strong but also very lean, visible six-pack and all; while for endurance athletes or dancers this maybe to be very slim and lean. Even if you don’t look like one of these women, being in a negative energy balance by too much or for too long can be detrimental to health and performance. 1. We may be training so much that without intervention to help us consistently match our output we may slip into a negative energy balance because our appetite can’t keep up. 2. Even for women that don’t train that often there is a phenomenon called ‘post exercise anorexia’, which is essentially having a reduced appetite after training. This means we are in a negative energy balance right when we really need to be taking on vital fuel to replenish our muscles and help us recover, we don’t want to eat! This all means that while our appetite signals are great, they are a little like your grandma giving you dating advice, they will do their best, but they aren’t exactly up to speed with this generation. So, we should absolutely listen to these hunger signals because they are doing their job the best they can, but especially as women who train we need to assess and have a plan to maintain energy balance at a healthy body fat percentage. Next intake just released for our 6 week online programs.